After a long Sunday afternoon of hitting the books, you’re too tired to make your way to the Dobbs University Center (DUC) for dinner. You open your mini fridge slowly, searching to stifle the hunger pangs in your stomach and see a cup of yogurt, some leftover pickles and the cream cheese you stole from Goizueta Business School’s Tuesday morning bagel days. To avoid this all-too-familiar lacking fridge, and in light of Sprouts Farmers Market’s grand opening on North Decatur Road, here is a guide to the grocery shops near Emory. Publix: Every weekday night, Emory’s C Publix shuttle takes students to and from Decatur’s local Publix. Upon entering the brightly-lit grocery store, customers may happen upon Publix’s fresh baked goods, or alternative “bougie” food choices, such as kale chips or pasta chips. There is a variety of both traditional convenience store goods, such as Oreos and Lay’s, and healthy, hearty options, such as Popcornopolis’ Zebra popcorn (white and dark chocolate kettle corn, yum) and Justin’s Naked Almond Butter. There’s also an aisle or two of fresh produce, as well as eggs, dairy and related fresh options. Sections for body care and personal health split the fresh produce and prepackaged goods, along with miscellaneous items such as greeting cards. Additionally, Publix’s iconic subs are found around the bakery area, where other cakes, bagels and muffins are sold. Price: Publix isn’t too expensive, taking the second cheapest on this list. A bag of groceries here may cost between $10 and $20. Sprouts: A Sprouts store just opened in Decatur, and it’s popping. When shoppers walk in, they’ll see shelves upon shelves of fresh, organic food. Sprouts is indeed an indoor farmer’s market. The majority of the store contains fresh produce, and displays a variety of fruits and veggies that one may find at their local supermarket, except with an emphasis on natural, organic and health-conscious products. Sprouts’ specialty is its bulk bins, which hold large quantities of raw ingredients such as lentils, soy protein isolate (protein shake, anyone? ), dried fruit and nuts, as well as candy and chocolate. Those bulk bins are self-serve — just grab a plastic film bag and scoop as much as you’d like to purchase. There is also a working deli and aisles for personal care, such as dry shampoo. Pro Tip: Sprouts’ coupon deals overlap on Wednesdays, meaning that coupons from the last week and the current week can be used at the same time, so customers can get double the deals. Price: The grocery store is a little pricier than Publix, but it’s not too bad either. You’ll likely pay around $20 to $30 for a bag of groceries. Whole Foods: Whole Foods is, without a doubt, the bougiest of the Emory options. The store is an experience: dim overhead lighting, inventory of hipster snacks and up-and-coming foods. Kind Bars, bunches of kale and vegan shrimp abound in this store, while other aisles offer mason jars and specialty toothpaste. Whole Foods leans toward the environmentally and socially responsible, ensuring their vegetarian options are abundant, and offers trash and recycling bins throughout the store. There is a bakery, a “hot bar” which serves any hot food, a gelato station, and a dining area.Whole Foods is the perfect place for customers tired of finding the same products over and over again at other grocery stores. Price: Whole Foods is the most expensive on this list. A bag of groceries will cost $45 to $65, if not more. 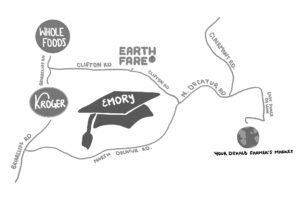 Earth Fare: A 10-minute walk from Woodruff Circle, Earth Fare is located on the side of Emory Point facing Clifton Road. Brightly lit and refreshing, the restaurant attracts a large portion of University students, both because of its convenience and variety. Earth Fare carries several specialty goods, from homemade soap to vegan ravioli. Furthermore, according to Yelp reviews from local vegans, the establishment carries a wide variety of non-GMO and organic products. Earth Fare is like a privately established, compact version of Whole Foods. Its goods are similar, though its variety is more limited, but more of their stock is organic and GMO-free. Earth Fare also has a bakery and pizzeria for those who get hungry while they shop. Price: Similar to Whole Foods. RIP. Your DeKalb Farmer’s Market: Up and bustling every day, DeKalb Farmer’s Market is laid out like a Costco that sells fresh ingredients and good food in bulk. Shoppers can find anything and everything, from worldwide fresh produce and home-churned almond butter to various loose leaf teas and coffee blends. Their fruit is top-notch, and pastries are made fresh daily at their bakery. They also have a hot bar and a salad bar — freshly made food is sold for $6 a box. The whole market is an indoor warehouse, so don’t expect polished wooden floors or imaginative decorations. In exchange for its lack of high-quality interior design, customers get good food, raw ingredients and baked sweets at a good value. Both organic and non-organic options are available. Price: A bag of food is around $10, which is not bad at all. Overall: There are a plethora of grocery shops around Emory, so you’re bound to find your perfect fit. All of these shops offer organic and natural products, with higher-end, branded products are available at Whole Foods and Earth Fare, while more bulk products are offered at Your DeKalb’s Farmer’s Market and Sprouts. 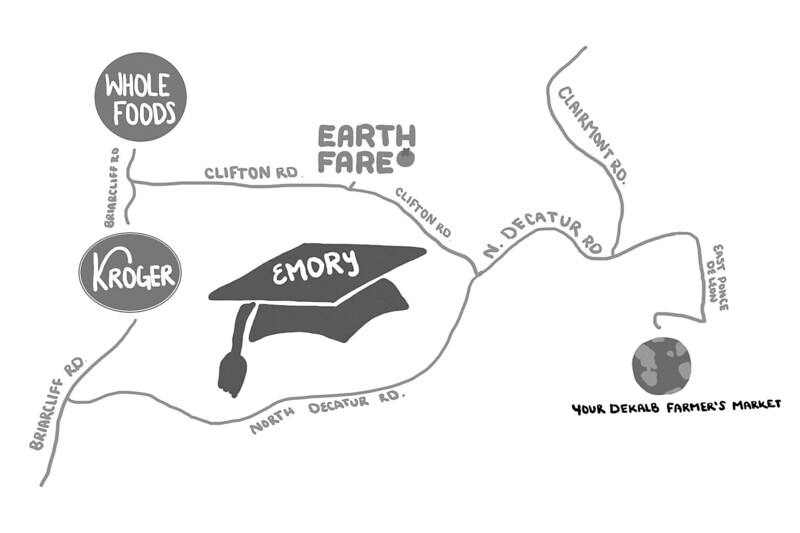 Now that you have a local guide to Emory’s surrounding grocery shops, best of luck, and have fun shopping.